David Roberts (1796–1864), Isle of Graia, Gulf of Akabah (1839), lithograph made by Pouis Haghe of original painting, published in book published 1842-45, US Library of Congress, Washington, DC. Wikimedia Commons. There are plenty of private beaches, but most of our coastline provides land which is free for anyone to use, in almost any imaginable way, within the law of the land. Most of us are content to lie down and read, snooze, sunbathe, play beach sports, or engage in any of the more regular activities. But for some, what is done on the beach is much more unusual, weird, or frankly horrifying. Here’s a little collection of paintings of odd things happening on beaches, and odd paintings about the coast. We like to think that some modern beach sports are innovative, exciting, and truly contemporary. Esaias van de Velde (1587–1630), circle of, Sandyacht Race in the Presence of Prince Maurice of Nassau on the Beach at Scheveningen (1608), oil on canvas, 98.5 × 192.5 cm, location not known. Wikimedia Commons. In this painting by one of the circle of Esaias van de Velde, we see a Sandyacht Race in the Presence of Prince Maurice of Nassau on the Beach at Scheveningen (1608). Five hundred years ago, the technology wasn’t as sophisticated as it is now, but there was no shortage of crews for these extraordinary vehicles. Those crews, and the bystanders, dressed very differently for the beach. So our ancestors did for centuries, whether they were relaxing there in the sun, or taking the waters. 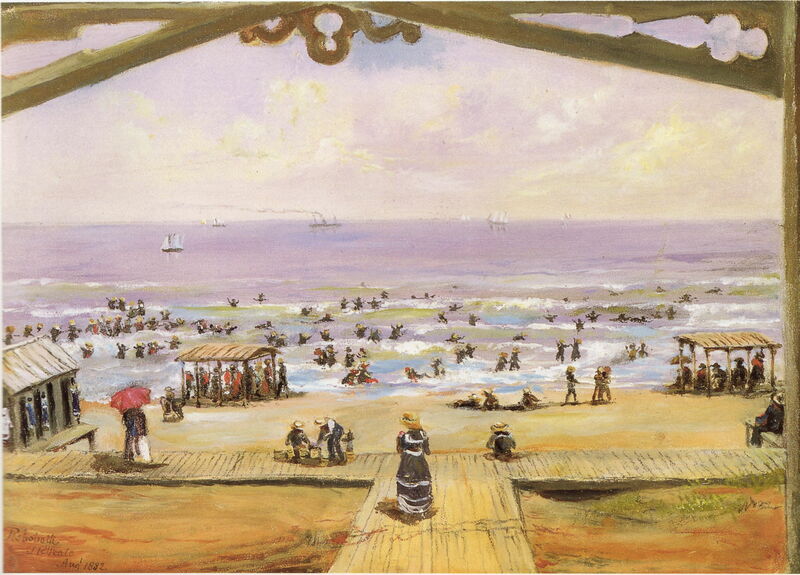 Eugène Boudin’s The Beach at Villerville (1864) shows a most incongruous sight: a crowd of mainly holidaymakers sitting on chairs as if in a city park, perhaps. The ladies have great crinolines and fine gloves, parading their fashion in dozens of layers of outer and under garments. When they took to the water, they either took nothing off and swam fully-clad, or removed the whole lot and bathed naked – in which case they gingerly entered the sea from the far end of a ‘bathing machine’. Titian Ramsay Peale (1799–1885), Bright House, Rehoboth Beach (1882), watercolour, Private collection. Wikimedia Commons. As Titian Ramsay Peale shows, in his Bright House, Rehoboth Beach (1882), the sight of all those fully-dressed bathers is very odd. This beach is on the Atlantic coast of the USA, in Sussex County of Delaware state. Until the late nineteenth century, it had been poor farmland, but in 1873 was established as a site for Methodist camp meetings. Its name is the Biblical Hebrew for broad spaces, and by 1893 it was becoming a popular beach resort for those working in Washington, DC. Despite the clothing, Rehoboth Beach has a subtropical climate, making you wonder what all those good people were thinking of at the time. Beaches are also associated with fishing communities, who remain vulnerable to death by drowning. Around this are many local legends, several of which have become the basis of art, most notably Benjamin Britten’s wonderful opera Peter Grimes (1945). 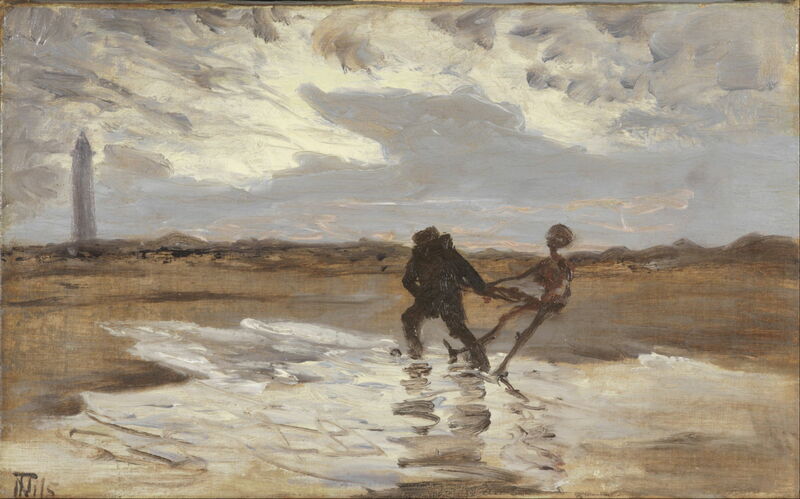 Thorvald Niss probably painted The Drowned Man’s Ghost Tries to Claim a New Victim for the Sea just before the end of the nineteenth century, and shows one popular version of these legends. In this, the ghost of a fisherman who died by drowning appears to a living fisherman, and tries to drag him to the sea, so that he can join him by dying in the water. Niss joined the Skagen artists in 1887, but later developed mental health problems, and his paintings are now almost forgotten. Beaches are also one of the sites in which some of our cultural heritage is preserved – performance arts which go back to mediaeval roots, and live on in slapstick puppet theatre for children. William S Horton (1865–1936), Punch on the Beach at Broadstairs, England (1920), oil on canvas, 64.5 × 78.1 cm, Hunter Museum of American Art, Chattanooga, TN. Wikimedia Commons. Visitors to the Hunter Museum of American Art, in Chattanooga, Tennessee, must find William S Horton’s painting of Punch on the Beach at Broadstairs, England (1920) quite cryptic. Horton was born in Grand Rapids, Michigan, and trained in Chicago, Paris, and New York, then painted almost entirely in Europe. 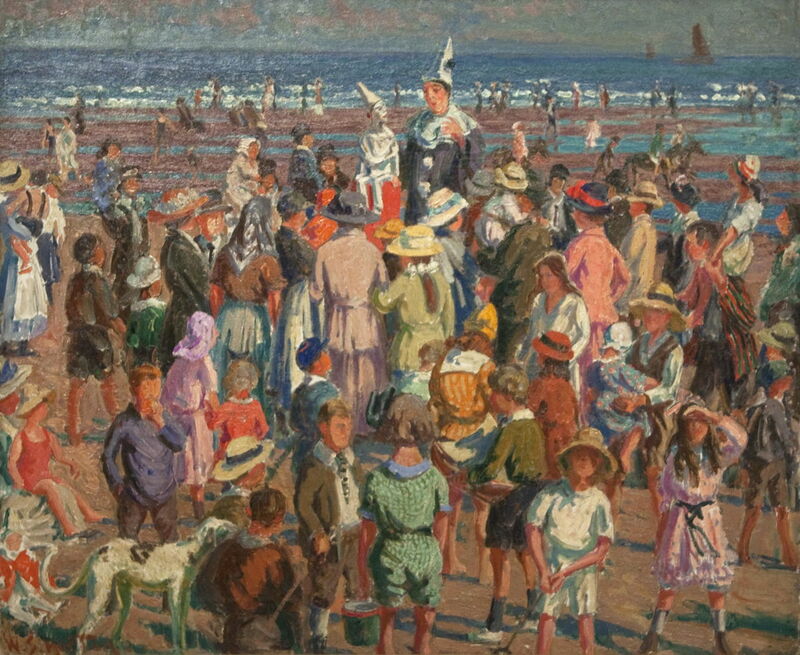 In about 1917, he arrived in Britain, and in 1920 painted this Punch and Judy show taking place on the beach at Broadstairs, Kent – a traditional family beach resort at the extreme eastern tip of the south-east coast of England. Punch and Judy shows have their origin in the sixteenth century Italian commedia dell’arte, with the lead male character, Mr Punch, based on Pulcinella, a trickster figure who batters his wife, Judy. The first recorded show in Britain was on 9 May 1662, using marionette puppets. For the last two hundred years or so, a stylised version performed using glove or other puppets has been popular with children visiting British resorts, and later beach resorts. In 1827, George Cruikshank made a series of sketches of a performance, which were turned into the first illustrated and printed script. The next painting would appear to be Japanese, showing a local coastal scene. 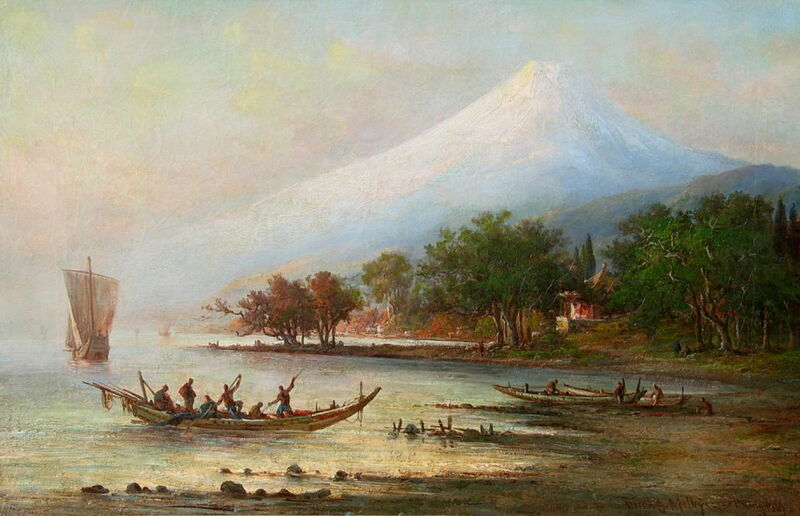 Fritz Melbye (1826–1869), Shipping off Fujiyama, Japan, in early Morning Light (1869), further details not known. Wikimedia Commons. It was, in fact, painted by Fritz Melbye (1826–1869), and shows Shipping off Fujiyama, Japan, in Early Morning Light (1869). Melbye, member of a family of prolific marine artists, was one of Camille Pissarro’s early friends, the one who inspired young Pissarro to become a professional artist. In 1852, Melbye was preparing for a trip to Venezuela, and Pissarro decided to join him in the venture. They lived for two years in Caracas and La Guaira, during which time Pissarro decided to pursue painting. It was largely Melbye who was responsible for inspiring one of the greatest landscape painters of all time, and a key member of the Impressionists. Melbye travelled widely, setting up his studio in New York for a while. In 1866, when Melbye set off on a painting campaign in China and the Far East, he entrusted that studio to the great American landscape artist Frederic Edwin Church. By 1869, Melbye was painting landscapes in Japan such as this, but sadly died later that year in Shanghai, China, at the age of only forty-three. For me, the most puzzling painting of a coast is the next, known normally as The Stages of Life (1834-5), by Caspar David Friedrich. 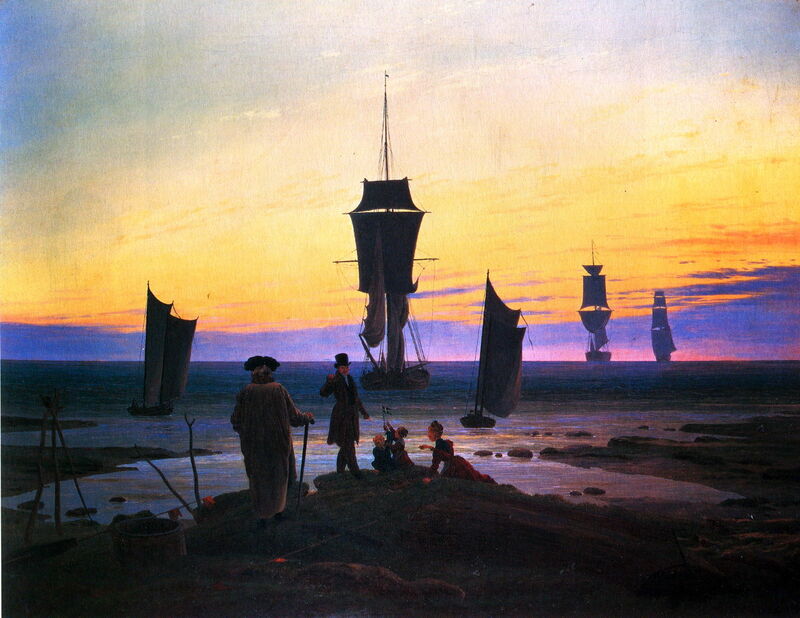 Most serenely beautiful, Friedrich’s five figures appear highly symbolic of the ‘stages’ of life, and there seems to be deep meaning in the series of ships sailing into this section of coast. It is intriguing, but its narrative remains an enigma. 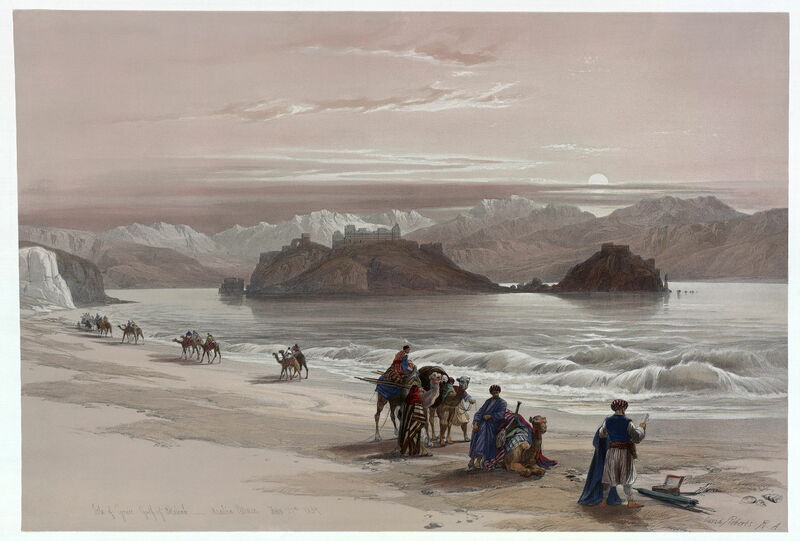 David Roberts’ painting of the Isle of Graia, Gulf of Akabah (1839), shown here as a lithograph, is unusual for showing camels on the beach. We are used to seeing dogs, horses, donkeys, even cows and sheep, but the ‘ship of the desert’ is not a common sight on the beach. The coastline of the Gulf of Aqaba (or Gulf of Eilat) is on the eastern side of the Sinai Peninsula, and before urbanisation, development, and the advent of tourists, had a wild beauty, as shown here in Roberts’ painting. James Jacques Joseph Tissot (1836-1902), The Ark Passes Over the Jordan (1896-1902), gouache on board, 21.4 x 27.6, The Jewish Museum, New York, NY. Wikimedia Commons. 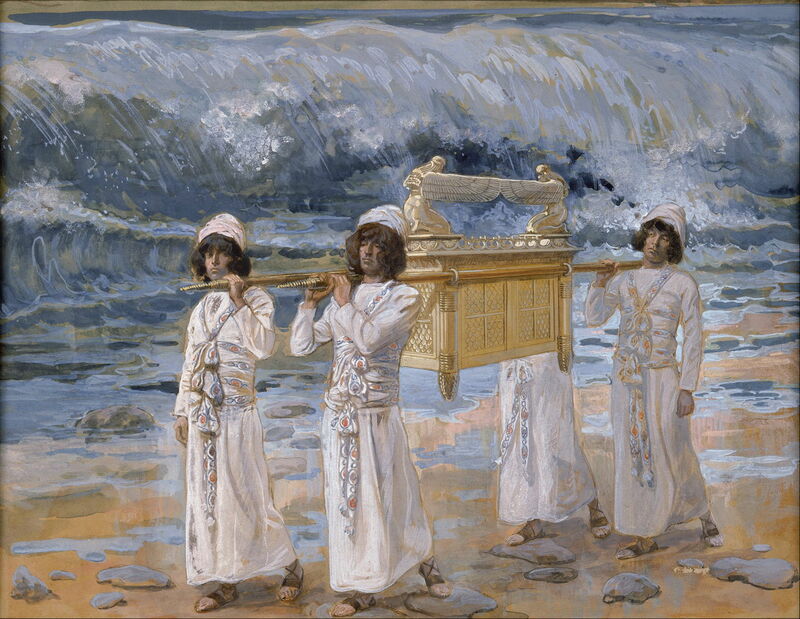 Although not strictly a coastal view, James Tissot’s fine gouache of The Ark Passes Over the Jordan (1896-1902) shows a unique sight, as this Jewish religious relic is carried over the Jordan. One of the best of Tissot’s paintings of the stories of the Old Testament, this huge and ambitious series was incomplete at his death. The Ark of the Covenant went missing during Old Testament times, and its whereabouts remain the subject of speculation, even in Steven Spielberg’s movie Raiders of the Lost Ark (1981). Among the many claims is that of Tudor Parfitt, who argued in 2008 that the Ark is hidden deep in a cave in the Dumghe Mountains, spiritual home to the Lemba people of South Africa. Beaches and coasts are very frequently boundaries and borders. When times become tense, guns and other defences against invasion are put along a threatened coast, and are later left to tell the story of their success, failure, or most commonly irrelevance. Frederik Hendrik Kaemmerer (1839–1904), At the Seashore (c 1895), further details not known. Wikimedia Commons. 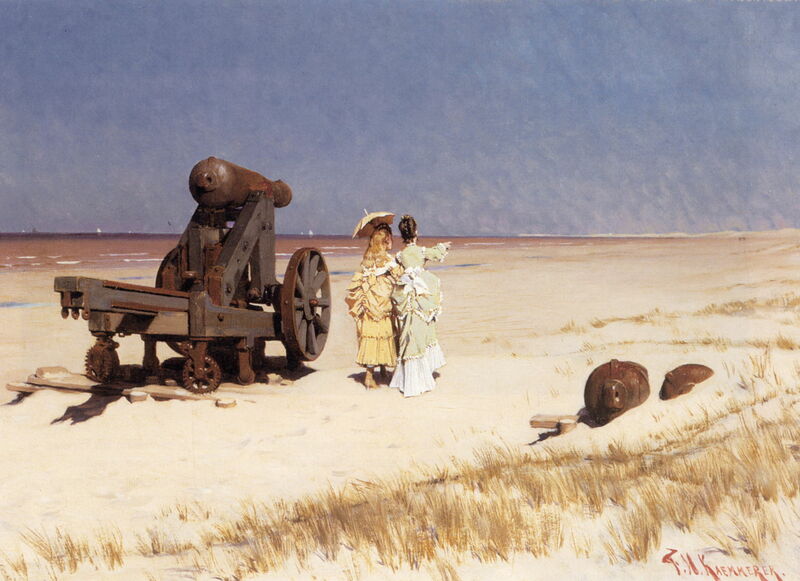 Frederik Kaemmerer’s strange painting of two women walking At the Seashore (c 1895) shows them strolling past a massive cannon, as if it were invisible. One is pointing into the distance, and the two are locked in conversation, as they pass the gun, which may have dated from the Napoleonic wars. On rare occasions, the beach is transformed into a stage on which man displays his inhumanity to other men. My final painting of the beach at Málaga in Spain comes with clear lessons for us all today. 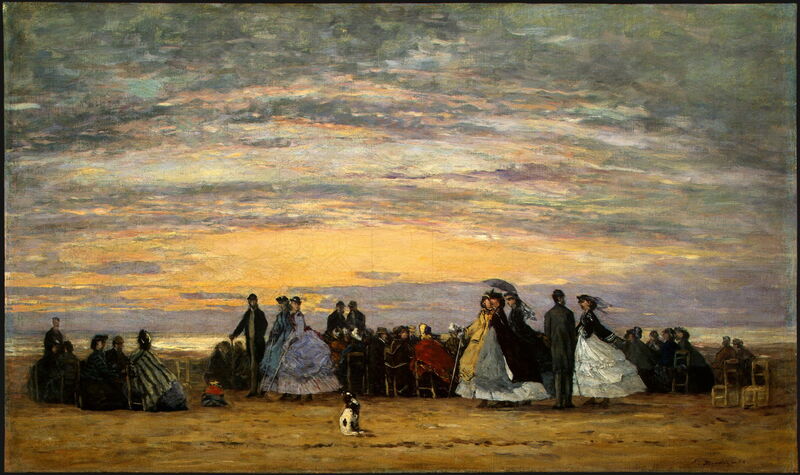 Antonio Gisbert (1834–1902), The Execution by Firing Squad of Torrijos and his Companions on the Beach at Málaga (1888), oil on canvas, 601 × 390 cm, Museo Nacional del Prado, Madrid, Spain. Wikimedia Commons. 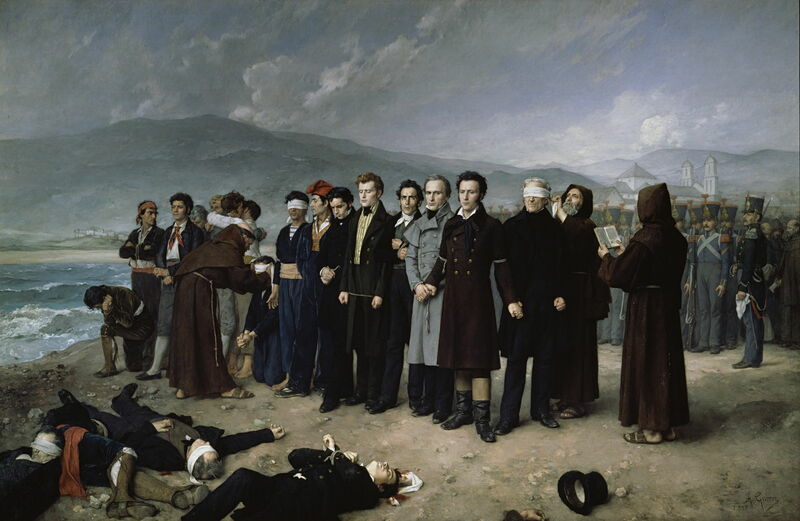 Antonio Gisbert’s huge painting of The Execution by Firing Squad of Torrijos and his Companions on the Beach at Málaga (1888) shows a terrible scene: the summary execution of nearly fifty people on 11 December 1831. General José María de Torrijos y Uriarte was highly successful in his military career, and during liberal government in 1820-23 was Captain General of Valencia, and Minister for War. When that regime came to an end in 1823, General Torrijos first fled to France, then to England, where he lived in London, being assisted by the Duke of Wellington, then Prime Minister. The liberal Spanish exiles organised themselves for a popular uprising in Spain, from 1827, and in 1831, Torrijos and his followers travelled to Gibraltar in readiness. They supported several attempts at insurrection in early 1831, each of which was brutally suppressed by the absolutist government under Ferdinand VII. The Governor of Málaga then tricked General Torrijos into believing that he was a supporter of the planned insurrection. On the morning of 2 December, General Torrijos and fifty-nine others landed at Málaga after a surprise attack by the ship Neptune. They intended to encourage a liberal uprising, and had brought a printed manifesto and several proclamations which they intended to promulgate. They were eventually ambushed after several days of walking, on 4 December, and surrendered, hoping that the situation in Málaga had improved. They underwent no trial, but at 1130 on Sunday 11 December 1831, all 49 who had been captured were shot dead by a firing squad on the beach. Their monument in the city of Málaga is in the Plaza de la Merced, right by the house where Pablo Picasso was born just fifty years later, on 25 October 1881. Posted in General, Life, Painting and tagged Boudin, coast, Friedrich, Gisbert, Horton, Kaemmerer, landscape, Melbye, Niss, painting, Peale, Roberts, Tissot, van de Velde. Bookmark the permalink.